Watch a video interview on echo trends with the authors of this article at ASE 2016. Read about how Echopixel’s technology may evolve into a replacement technology for angiography for transcatheter structural heart interventions. Watch a video on how cardiac strain is being applied to measure cardiac toxicity from cancer therapies. For more on advances in hand-held or pocket ultrasound technology, watch the video “Trends in Medical Imaging at RSNA 2015” which includes a segment with examples of the same technology shown at ASE 2016. 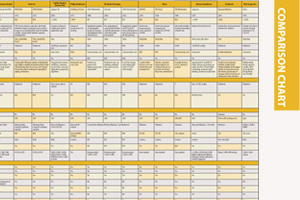 ITN has created an apples-to-apples comparison chart of technical specifications of both echocardiography and point of care ultrasound systems used for cardiac evaluation. The chart requires a login, which is free and only takes a minute to sign up. It can be accessed at www.itnonline.com/content/cardiovascular-ultrasound. Editor’s note: Jon Brubaker, MBA, RCVT and Sabrina Newell MS, RCS, are clinical analysts from the evidence-based research and consulting company MD Buyline. It provides hospitals and healthcare systems information to help make sound financial decisions for purchased services, capital equipment and technology and consumables.